It is the responsibility of each client to ensure that they have a thorough understanding of the nature of spread betting and the inherent risks involved. In addition, each client must also ensure they are aware of the terms and conditions which govern the specific markets quoted by SportsSpread. Where any confusion or any misunderstanding exists, the onus is on the client to clarify the issue. Our traders are happy to answer any questions regarding any of the markets in which we operate and it is assumed that the client is aware of all the information, which would have been provided had these questions been asked. SportsSpread will do its best to ensure that all information provided is accurate and up-to-date. However, in the unlikely event that we inadvertently provide inaccurate information, we accept no responsibility for this and the use to which this information may be put. Bets on any event, the duration of which is expected to be one day or less, which is postponed and not completed within 6 days of its original fixture date, will be void. Bets on any event, the duration of which is expected to be two or more days, which is not completed within 21 days of the day it was scheduled to be completed, will be void. It should be noted that a delay in the start time of an event does not affect the status of any bet on that event if the completion of the event conforms to the guidelines set out above. When prices are offered on an event after the event has begun (i.e. in running betting or half-time updated prices) and the event is abandoned, all open bets will be settled at the mid-point of the last quote available before the event was abandoned. If, however, prices are offered during an event (i.e. in running betting) and a bet is closed before the event is abandoned, the bet will be settled on the basis of the price at which the bet was closed. If there is no 'latest quote' available at the time when the event is abandoned (i.e. no in running betting), all bets on the underlying event will be void. SportsSpread reserves the right to void any bet placed on the basis of incorrect information. Similarly, SportsSpread reserves the right to void any bet placed if it had been possible to determine the outcome of the bet at the time at which the bet was being placed. However, it may happen that an 'in running' bet is placed on the basis of an incorrect 'current score' in an event, in which case the bet will be adjusted to take into account the correct 'current score' at the time the bet was placed. SportsSpread may, from time to time, quote prices on markets or events which may not be specifically referred to in our rules. The settlement of these bets will be based on SportsSpread's interpretation and determination. The decision of SportsSpread on the settlements will be final. The official result is final for settlement purposes. Final settlement on all bets will take place within 6 days of the day on which the underlying event was completed. It is the responsibility of the client to ensure that they are fully aware of all terms, conditions and stipulations regarding the markets quoted by SportsSpread.com. We will be happy to answer all questions relating to these markets and it is assumed the client is aware of all information that would have been provided had these questions been asked. The opening of an account and/or the depositing of funds and/or the placing of a bet with SportsSpread.com.com signifies your acceptance of all our betting rules and/or all of our terms and conditions, whether or not you have familiarised yourself with them. You are also agreeing to abide by decisions made under these betting rules and/or terms and conditions of Tradespreads CR S.R.L. which is licenced to offer the spread betting service. SportsSpread.com reserves the right to limit the stake on any bet in any of its markets. SportsSpread.com also reserves the right to refuse the whole or any part of any bet without giving an explanation. SportsSpread.com reserves the right to limit the aggregate size of outstanding bets held by any client at any time in any market. SportsSpread.com may, at its discretion, amend the Stop-Loss/Stop-Win on any of its markets at any time. Clients may be notified of any such changes, at the discretion of SportsSpread.com. It is the responsibility of the client to ensure that there is no unauthorised use of his/her account. Any bet, which has been placed using the client's LOGIN I/D and Password that matches the details on our system, will be accepted as bona fide. SportsSpread.com does not monitor the betting pattern of its clients. Bets cannot be accepted from persons under the age of 18. SportsSpread.com will never advise a client on whether or not to place a bet. We merely facilitate the execution of a bet. SportsSpread.com will provide factual information if it is available. It is the responsibility of the client to verify that the bet has been accepted correctly and that any positions being held on the client account are correct. SportsSpread.com accepts no responsibility for any total or partial failure of our responsibilities caused by an act of God or by any means beyond our control. In the event that we offer prices on markets not described on this site, it is the responsibility of the client to ensure that he is fully aware of the terms and trading conditions of these bets and the inherent stop loss/stop win associated with these bets. SportsSpread.com reserves the right to void, at its own discretion, any bets involving an obvious market error at any time even after the market has been settled. SportsSpread.com will void any open bets suspected of fraudulent activity. SportsSpread.com reserves the right to close any open position at their own discretion. SportsSpread.com will typically attempt to contact a client before taking this action but in the event that no contact is possible SportsSpread.com will close the open position(s) and shall not be liable for any losses that the client may incur as a result, either directly or indirectly. Spread betting is a leveraged product and as such you may lose more than your initial deposit or credit balance. Clients may be subject to margin calls at short notice whereby additional margin is required to maintain your open bet. If additional margin is not provided within the time required, an open bet may be closed at a loss and the client will be liable for the resulting deficit. In the case where a clients’ losses or required margin exceeds their positive balance, SportsSpread.com reserve the right to recoup the remainder of the balance using a payment method previously registered on our systems by the client. SportsSpread.com will typically make at least one attempt to contact a client in advance of any such instances. Most Markets have a stop loss. Losses are limited in these markets to the defined stop loss. In the markets where losses are unlimited the cash that you deposit with us does not limit your potential losses. A deposit is a sum of money credited to any account held by you with us, (deposited or won) that is available for you to bet against. If you incur losses on open bets we may require you to deposit additional funds ("margin") with us as a condition of maintaining your open bets. It is the client's responsibility to ensure that they are fully aware of any price movements that might affect any open positions on their account. It is not our policy to contact clients to inform them of any negative movements on any open position(s). All clients should be advised that they must provide identity documentation in the form of a driver’s license/passport and a proof of address in the form of a utility bill/bank statement dated within the last 3 months before they can withdraw funds from their account. The minimum withdrawal amount is £50 (or currency equivalent). All new clients must wait 30 days after their initial deposit before a withdrawal can be processed on their account. This is due to security and compliance protocols. This is a mandatory condition which has been imposed on this business due to legacy fraudulent activity and is in no way a reflection of individual clients. The maximum initial withdrawal limit after 30 days is €3,000 equivalent as a new client. The maximum withdrawal after 60 days is €5,000 in any 30-Day Period. For existing clients, the maximum cumulative withdrawal in any 30-day period thereafter cannot exceed €5,000 equivalent for all standard accounts. Standard accounts can be upgraded and withdrawal limits increased by prior consent and are dealt with on a case by case basis. The firm may void any new account offer and /or any free bet offer, if we deem the spirit of the free bet offer is being abused. Similarly, if we find evidence of collusion between clients to unfairly take advantage of the offers, we reserve the right to immediately suspend the accounts in question. (a)	There is a maximum withdrawal of twice the amount received in bonuses or promotions in a 30-day period. (b)	Any winnings in excess of this are then subject to the same turnover requirements as the original offer under a new 30-day period. (c)	Funds deposited plus any winnings from a free bet have to be turned over twice before any withdrawals can be processed. All accounts are subject to the SportsSpread.com KYC policy. We reserve the right to suspend any account which we feel is in breach of this policy. All accounts must be operated by the registered named individual on the account. Accounts which breach this policy will be immediately suspended and all bets placed on the account may be deemed void and all funds held on the account may be forfeit. Winnings derived from bonuses, goodwill gestures or any form of promotion cannot be withdrawn for at least 30 days. This is in addition to any turnover criteria attached to them. Turnover is always calculated as follows unless otherwise stated: Stake multiplied by half the width of the spread (SSV) on every bet placed. Clients who receive goodwill and/or refund offers and are subsequently deemed by SportsSpread.com to have abused the spirit of the offer or manipulated it to receive risk free funds, will have their accounts closed and all transactions on their account voided. 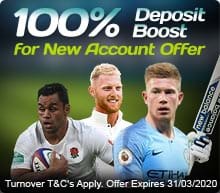 Any client who receives a cash/bonus promotion but does not deposit any of their own funds may not withdraw the cash/bonus or any associated winnings for a 90-day period. The account must also be deemed 'active' during the 90-day period. Any existing account which has been inactive for 12 months or more will be deemed to be a new account once it has become active again and will be subject to all terms and conditions associated with new accounts. The account will be deemed to be active again after the latest bet is placed following the period of inactivity. SportsSpread.com offers a wide range of generous offers to its clients on an ongoing basis. These can include bonus offers, cash top ups, goodwill offers and occasional write offs. of small debit balances. 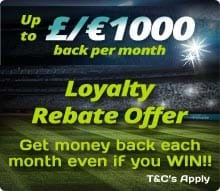 These offers are designed to stimulate business activity for us by offering opportunities to new or existing clients to bet with very low risk or in some cases no risk at all to see if they subsequently wish to bet with their own funds. However, the company has to operate on a very low tolerance with anyone who chooses to abuse these. Therefore, if the company believes any such offers given by the company have been abused or in any way deliberately manipulated it deems the spirit in which the offer to have been proffered to be broken and the company may at its discretion void all transactions on the account. Abusive or offensive language of Sports Spread or any of its staff will not be tolerated. You hereby agree that you shall not post any unlawful, obscene, libellous, defamatory, threatening, or other materials that would violate any law or generally be considered to be offensive. Abusive or offensive language includes, but is not limited to, any statements that are in Sports Spread's sole opinion, obscene, profane, racist, in bad taste, slanderous or unnecessarily hostile. Further, you agree you shall not make any statements Sports Spread that are untrue or would reasonably be considered to be derogatory. (e) Undertaking fraudulent practice or criminal activity. The exploitation by you, of an 'Error', in any case either to your advantage and/or to the disadvantage of us or other. All withdrawals based on account closures are subject to a €100 processing fee. As a spread betting company the provision of credit either directly via a sanctioned mutually agreed credit limit or indirectly via an account falling into a debit balance from adverse betting outcomes is a necessity. (a) Any client who the company has had difficulty in settling their account the company reserves the right to apply an appropriate quid pro quo settlement agreement. In practical terms this means if a client takes three months to settle their account the company at its discretion may choose to only pay out after a three-month period when the client wins. (b) If an account is “inactive” (i.e. has not been logged into (or out), has not had funds deposited in it or withdrawn from it, nor has had a bet placed from it or a bet settled within it and which, for the avoidance of doubt, does not include accounts which have been inactive as a result of self-exclusion) for longer than 12 consecutive months, then Sports Spread has the right to commence charging an administrative fee of €5 per month to be calculated with effect from the commencement date of inactivity. This fee shall continue to be levied until the earlier of (1) thirty months from the commencement date of inactivity (2) the account is closed, or (3) the customer recommences activity on his account. Tradespreads CR S.R.L. which operates and manages the website SportsSpread.com. may at its discretion engage new or alternative third-party service providers in respect of Additional Gaming Services or any other of its Services. By registering or playing with any such third parties, you thereby provide your consent to any applicable additional terms and conditions of such third parties as they may be amended from time to time, including but not limited to any change to the third-party service provider itself. Tradespreads CR S.R.L.which operates and manages the website reserves the right to amend the Terms & Conditions at any time, as may be required for a number of reasons including (without limitation) for commercial reasons, to comply with law or regulations, to comply with instructions, guidance or recommendations from a regulatory body, or for customer service reasons. Where we wish to make material changes to the Terms & Conditions, we will endeavour to give you as much prior notice of such changes as is reasonably practicable. Any such revision will be binding and effective from such date as is specified in any such notice and/or the date of amendment. Please check these Terms & Conditions frequently for updates. By accepting these Terms and Conditions and/or placing bets or wagers and/or making use (whether authorised or not) of the facilities offered by SportsSpread.com (whether through the Website or otherwise), you irrevocably agree that the courts of the Republic of Costa Rica shall have exclusive jurisdiction to settle any dispute which may arise out of or in connection with these Terms and Conditions. Notwithstanding the foregoing SportsSpread.com be entitled to bring a claim against a customer in the court of the customer's country of domicile. By agreeing to the Terms and Conditions you authorise us to undertake any such verification checks from time to time as we may require ourselves or may be required by third parties (including, but not limited to, regulatory bodies) to confirm these facts (the "Checks"). You agree that from time to time, upon our request, you may be required to provide additional details in respect of any of such information you have provided us, including in relation to any deposits which you have made into your account. Whilst we are undertaking any checks from time to time, we may restrict you from withdrawing funds from your account and/or prevent access to all or certain parts of the Website. Please note that we may from time to time perform the Checks for regulatory, security or other business reasons. If any such restrictions cause you a problem, please contact Customer Services. In certain circumstances we may have to contact you and ask you to provide further information to us directly in order to complete the Checks. For this purpose, we will be entitled, at our sole discretion, to require that you provide us with a notarised ID or any equivalent certified ID according to the applicable law of your jurisdiction or otherwise, proof of address, utility bills, bank details, bank statements and bank references. Until such information has been supplied to our satisfaction, we may prevent any activity to be undertaken by you in relation to the Account or we may, where we reasonably believe that deliberately incorrect information has been provided by you, keep any amount deposited on the Account following the closure of the Account by us. The information on this site is directed at residents of the United States, the United Kingdom and members of the European Union where gambling is a legal activity and is not intended for distribution to, or use by, any person in any country or jurisdiction where such distribution or use would be contrary to local law or regulation. It is the responsibility of visitors to this site to ascertain the terms of and comply with any local law or regulation to which they are subject. Whilst SportsSpread.com has made every effort to ensure the accuracy of the information on this site, the information given on the site is subject to change, often without notice. It is for guidance only and no liability is accepted by SportsSpread.com for its accuracy or otherwise. Under the terms Betting Amendment Act 2015, SportsSpread.com will not accept clients who are domiciled in Ireland. For the avoidance of doubt this refers to anyone who lives in Ireland, pays tax in Ireland or is in receipt of any Irish Government payment such as pensions or social welfare payments. SportsSpread.com will not accept clients domiciled in Sweden following the enactment of the Gambling Act there which came into force in 2019. Giving false or misleading information to the Company, its servants or agents, will be deemed to be fraudulent and all monies deposited, or held by the company, may be forfeited by the client at the Company's discretion. For further information, or clarification, please contact info@sportsspread.com.